The New York Harbor School provides a college and career preparatory education built upon New York City’s maritime experience that instills in students the ethics of environmental stewardship and restoration, plus the skills associated with careers on the water. The Urban Assembly New York Harbor is located on the restored and repurposed former military property called Governors Island in the heart of New York Harbor. The school is accessible only by ferry, offering a unique, on-water learning experience for all its students. Their students learn to build and operate boats; spawn and harvest millions of oysters; design submersible, remotely operated vehicles; conduct real-life research; and dive underwater. 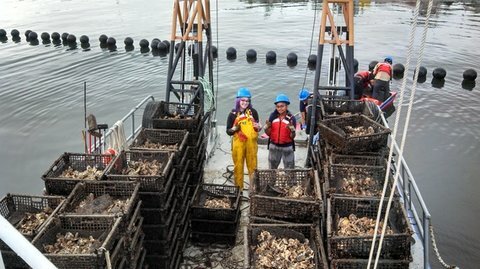 Students go on trips, tour colleges, hear and learn from experts in science and industry and participate in the school’s on-going oyster restoration research program through The Billion Oyster Project. The Billion Oyster Project is an exciting effort to connect middle school classrooms around New York City with the history and future of New York Harbor through the restoration of a legendary bivalve. In present day New York, oysters are better associated with the Oyster Bar in the cellar of New York’s Grand Central Terminal, where oysters from Apalachicola Bay in Florida and Chincoteague Bay in Maryland are now the delicacy. Generations of pollution drove out New York oystering, and today the name “Gowanus” is identified less with the bay and more with the canal, a toxic federal Superfund site (hopefully on its way to a major cleanup). But the Billion Oyster Project, the brainchild of the New York Harbor School, aims to change all that by enlisting hundreds of thousands of city school children to restore a billion oysters to city waters. See New York Harbor School website.